Has Cleveland's Restaurant Industry Bitten Off More Than It Can Chew? Cleveland has become one of the Midwest's top dining destinations. The national food press -Gourmet, Food & Wine, and Esquire - have praised Cleveland's chefs and innovative food scene. The New York Times, Travel + Leisure, and Fodor's all put Cleveland on their "must travel" list, largely on the merit of our restaurants. Despite the awards and accolades, it can be argued that the city's restaurants are in a tenuous position. While the number of downtown residents are on the rise, they alone cannot sustain the number of restaurants opening in our urban center. Has our city reached restaurant saturation? How do the city's economic development efforts - including business and talent attraction and retention and the proposed minimum wage increase - affect this burgeoning industry? 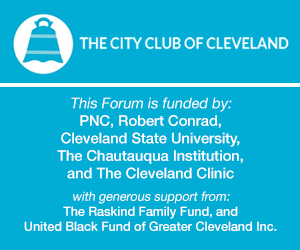 This City Club Forum features chef and restauranteur Zachary Bruell, and Dining Editor and The New York Times best-selling cookbook author Doug Trattner, discuss the evolution of the restaurant industry in Cleveland - and what our city and residents need to do to ensure its continued success.